The Phaser, the PlayStation Move attachment awed people at Sony's E3 press conference. Star Trek has hardly ever done action-adventure shooters on a console and has never done them with a playable Kirk and Spock. It will then be wish fulfilment for many when brought together in a third-person shooter, with cooperative, drop-in/drop-out play through all of its game modes. Digital Extremes made Spock and Kirk work cooperatively but asymmetrically through using unique weapons and talents on the same targets. Some sequences will place them together on the screen doing different things. Any story advancement typically accomplished by a cut scene will be instead done during live gameplay. However, Star Trek didn’t devolve into a run-and-gun shooter. You have your Federation weaponry with good old stun/kill settings. The Tricorder on the other hand is as indispensible as any weapon. Star Trek has a robust weapons load out. Kirk and Spock progress through the game though, they’ll discover and unlock special customization talents that are portable weapon-to-weapon. The game really looks fun, with or without the Phaser. 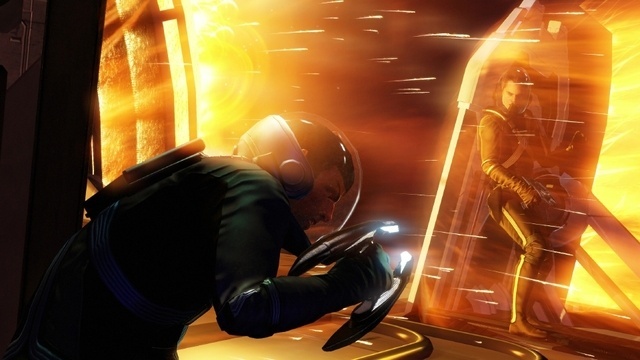 Star Trek will be released in 2012 for Xbox 360, PS3 and PC.